The blue bible's fifth edition features the new Indian captain, Virat Kohli, on its cover for this year. A further article about Kohli, the Cricketer of the Year, is found within the almanack. 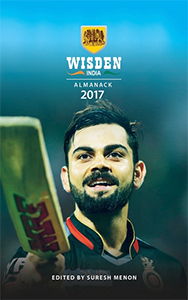 Kohli's impressive start to his tenure as both batsman and captain makes him a thoroughly deserved face on this year's Wisden India. In addition to the excellent and thorough sections devoted to international cricket, there are also two sections on women's cricket covering both domestic and international. It is also pleasing to see an article earlier in the almanack by Mithali Raj, possibly the most well-known Indian lady cricketer and photograph with trademark sun hat. Other articles include the direction of cricket by the ever-erudite Simon Barnes and a eulogy for the recently-departed and great Martin Crowe. A further one, About a Boy, charts the remarkable unbeaten 1009 - significantly the highest-ever individual score in any form of cricket - by Pranav Dhanawade. One wonders how his career may progress. Honours for the Five Cricketers of the Year are again shared equally between various cricketing countries. From India, Shreyas Iyer; Pakistan, Yasir Shah; Bangladesh, Mustafizur Rahman; Sri Lanka, Kusal Mendis and David Warner from Australia make up this edition's quintet. The IPL may have taken around seven weeks to complete but Wisden India's coverage is compact with a reasonable amount of space devoted to the tournament. Once again, Wisden India 2017 is an invaluable reference source for any cricket lover.